From a very young age Bibi Sukhdev Kaur received encouragement from Bhai Sahib Randheer Singh jee to do path and he himself had her do it for him. Bibi jee would bathe, put on fresh clothes and then commence the path as Bhai Sahib would stand behind her and do Chaur with one hand and put his other hand on her head. Usually, only I, Thakur Singh was the listener. 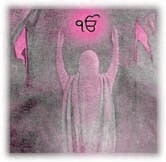 I learned there that when the beloveds of the Guru give their blessings, consciousness can fly into the heavens. 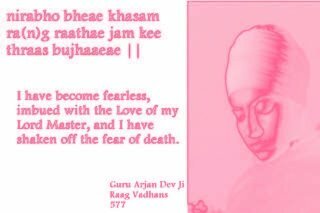 Not only in keertan are the sweet arrows of love released, but even in Gurbani path these arrows are felt and affect not only the soul but even the body. I remember that I could only listen to this divinely inspired path for a half hour or forty five minutes. I would then request she stop. These days are hard to forget. The entire atmosphere would be perfomed with Keertan and Gurbani path. The brother drew his sword and despite the protests of their mother, dragged Bibi Sukhdev Kaur into the animals’ yard. He said “Now something is going to happen." Seeing her firmness, the brother brought Bibi jee back to her mother and told her to convince her daughter. The mother began to cry and lay down on the bed beside Bibi jee. Bibi jee told us that in this frightening situation, her simran was going with great power and there was no sign of fear within her. 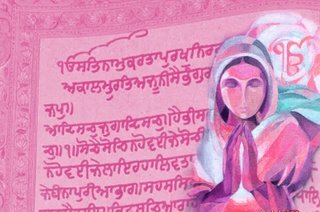 Guru jee, the True Lord, appeared in person before her and gave her courage and blessed her with a simarnaa (this simarnaa is still with the Bibi). Then what? Bibi jee became totally ready for anything. The brother thought for a moment and then threw down his sword. Bibi jee replied, “Only Bhai Sahib can tell you that”. It was her destiny that day I had sent my nephew Dyaal Singh to Bhai Sahib with something to give to him. When Bibi jee told Bhai Sahib what had happened the previous night and how Satuguru jee had himself appeared and protected her, Bhai Sahib became very happy and called for me that very morning. I arrived at Narnagvaal and he related the entire story to me. I put my head at his feet. Sanjog (those whom we are to meet) are determined before our birth. Bibi Sukhdev Kaur was sitting there, and approval was given for marriage to my nephew. Bibi jee went home and told her family what had happened and when her family found out what an educated and suitable boy had been found, they all went to Bhai Sahib’s house and the ardaas for the engagement was performed. Bhai Sahib was so happy about this. He said to me, “Jogee! This is the blessing of the True Lord! You have preserved our honour. The lord shall bless you immensely. After this, the marriage took place with great fanfare. Bhai Sahib till the end gave immense love to Bibi Sukhdev Kaur and Bibi ji too lived her entire life according to Gurmat. 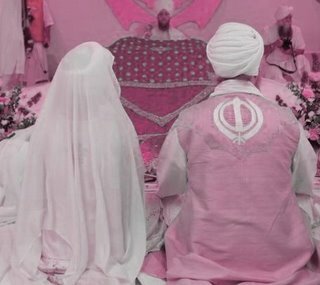 Sikhs are forbidden from forcibly marrying off their children without their prior consent. Both Sons and Daughters are required to reach a mature age, both physically and mentally, before they marry. Thus, parents must ensure their children are allowed to grow and be educated to the fullest. Arranged marriages are the norm for people in the Punjabi culture. THIS IS DEFINETLY FATE...all in God's grace, the 1st time I have visited your blog and I notice our Sikh Speak extract with Snatam Kaur Khalsa's interview, glad you enjoyed it, it was a fun experience doing the interview - THE FIRST WE DID IN FACT - Look out for the FULL MAGAZINE coming soon, email to be on the mailing list or perhaps you would like to write on SIKH WOMEN and ISSUES - we'd love to her from you! May i know who is Bibi Sukhdev Kaur, Is she related to our History, I can't understand about them, but i understand the message of this Artical. Bibi Sukhdev Kaur was a Gursikh Singhnee of the times of Bhai Randhir Singh Jee thats is a story about her jeevan. wow, wat a pleasure to tell that bibi sukhdev kaur ji is my grandmother.